Home » Diabetes Tips » Could This Simple Solution Prevent Diabetes? Could This Simple Solution Prevent Diabetes? Diabetes is a serious disease in every way. Its symptoms are alarming and encompass everything from nerve damage (that can lead to amputation) to serious vision problems. According to the National Institutes of Health, 25 million people have diabetes right now in the United States. You would think that tackling a health condition of this proportion would involve some pretty complex and high-tech therapies. But what if something as simple as probiotics could help to stave off diabetes? This is exactly what researchers from India are proposing. Probiotics are full of the good kind of bacteria and have cropped up in health-food stores all over North America, primarily to be used as a digestive aid. And it’s exactly this link that has led the Indian researchers to suggest probiotics could help prevent the onset of diabetes. It’s a case of three different effects coming together to prevent one disease. Diabetes is a metabolic disease. Metabolic diseases are ushered in by high cholesterol, obesity, and systemic inflammation. It just so happens that probiotics can target those three health problems. A culture of the bacteria Lactobacillus fermentum KC4b, for example, can remove almost 15 grams of cholesterol from a culture medium during lab tests. The less cholesterol you have, the lower your risk for type 2 diabetes. ALSO: How probiotics protect your bones as you age. Probiotics also have the ability to reduce the amount of oxidative damage that can happen to lipids. When fat cells are damaged, they can’t be metabolized as easily. Improving lipid metabolism lowers your cholesterol levels and your risk for obesity. 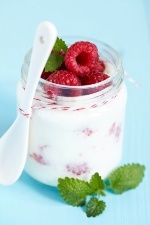 And finally, adding probiotics to your diet could help improve your immune response. According to the researchers, probiotics boost your immune function without triggering a release of inflammatory cytokines—those messengers in your body that trigger inflammation. By keeping inflammation in your cells under wraps, you’ll be reducing your risk for the onset of inflammatory-induced diabetes. Lower your risk for type 2 diabetes by adding some probiotics to your diet. Probiotics can be taken in capsule form, in powder form (add it to drinks and smoothies), and in a sort of pre-made yogurt, which is actually quite tasty. Get to work building up the good bacteria in your body and keep yourself fortified against disease. Aggarwal, J., et al., “Probiotics and their Effects on Metabolic Diseases: An Update,” J Clin Diagn Res. January 2013; 7(1): 173-7.